1. Remove the intake air duct 2. Disconnect the A/T clutch pressure control solenoid valve A connector. 3. 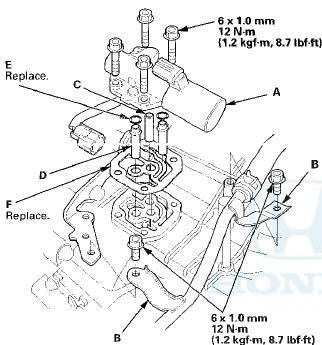 Remove the bolts securing the ATF cooler line brackets (B), then remove A/T clutch pressure control solenoid valve A. 4. Remove the ATF pipe (C), the ATF joint pipes (D), the O-rings (E), and the gasket (F). 5. Clean the mounting surface and the fluid passages of the transmission housing. 6. Install a new gasket on the transmission housing, and install the ATF pipe and the ATF joint pipes. Install new O-rings over the ATF joint pipes. 7. Install a new A/T clutch pressure control solenoid valve A. 8. Secure the ATF cooler inlet brackets with the bolts. 9. Check the connector for rust, dirt, or oil, and clean or repair if necessary. Then connect the connector securely. 10. Install the intake air duct.